This episode was broadcast as the first episode of the second season although it's in the first season. Leonardo DiCaprio was asked to be in this episode. The Titanic was the hardest 3D model. Ironically, Dr. Zoidberg is in a luxury room. Countess de la Roca isn't actually named after a crew member Claudia de la Roca. The episode has five different subplots, which is unusual. Each of the nebulae have a color. 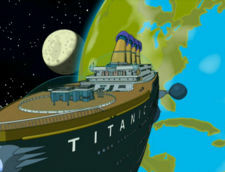 The Titanic is seen in a future episode during a flashback. Bender's neck isn't affected by magnets, so he can wear the magnetic bow tie without singing folk songs. The episode is one part 'Titanic', two parts 'Love Boat' and one part 'Three's Company'. Matt Groening has never seen 'Titanic', 'Love Boat' or 'Three's Company' (or Star Trek!). Stars were hard to animate, as they are in so many scenes. They always use songs without copyright, so they don't have to pay. Fans apparently post complaints on the Internet that Fry and Leela aren't together yet. This episode features lots of music. Kif and Amy's relationship was meant to be a joke, but in later seasons they developed a strong relationship. Eric Horsted: I had to watch the movie to write the episode but I just ended up crying. David X. Cohen: Take that you *******!! Peter Avanzino: I miss the cold opening! David X. Cohen: I have never seen Titanic. This page was last edited on 25 August 2012, at 22:14.